Continuing on from yesterday's theme, I seem to have successfully let go of some of the things which I've previously had the opportunity to do under more ideal (read: less busy) conditions. These are things that not only seem just plain too difficult (if not impossible) now, but could even be seen as me taking away the chance for someone else to do the same. In the case of the mosque here in Madinah, we've had chances to pray in the Riadhul Jannah a fair few times with no contention - these were the times when a congregation wouldn't even be big enough to fill up the green dome part of the complex. 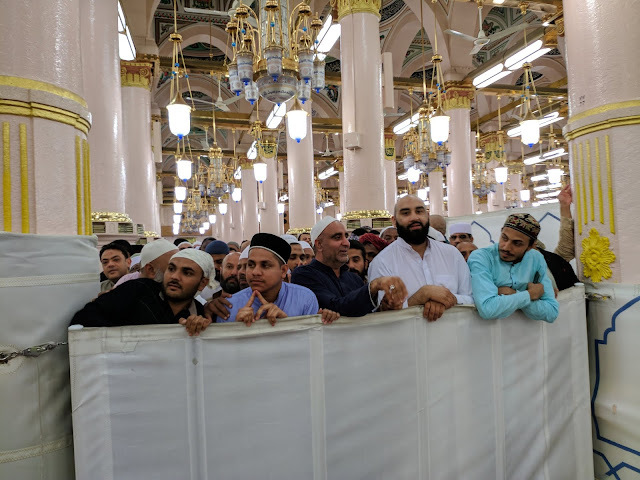 Similarly I fondly remember being able to pass by the resting place of The Prophet in comfort as a family (ie with both of my parents) and spending as much time as we liked there. It's safe to say that those days are now over. So spiritually there seems less profit in queuing up in the mad rush for the Riadhul Jannah and the immediate opportunity afterwards to pass salaam to our Prophet within an arms distance, when we could instead just stick to the much more effective and pleasurable fast track just 2-3m away instead. So my tip of the day is to just head to the Salaam Gate and pass your salutations in comfort and peace. A part of me laments probably never being able to do these particulars again, but it's also liberating and perhaps even more pure of thought and intent to let go of ritual practice and find comfort in the, perhaps more genuine, pragmatic. And of course I'm ever thankful for being in the position where these things can even be considered optional to do.